Stems: Spreading or ascending, branched, minutely hirsute. Leaves: Basal and cauline, simple; petiole present; blade reniform in outline, .5 to 1.2 inch long, .2 to .6 inch wide, margins deeply palmately divided nearly to petiole into 5-9 main segments, each segment further divided into several toothed, oblong, or linear lobes. Inflorescences: Cymes, umbel-like, or flowers solitary. Flowers: Sepals 5, distinct, ovate, .1 to .16 inch, apex tapered to minute sharp point; petals 5, pink to purple, distinct, wedge-shaped, .08 to .1 inch, apex shallowly to deeply notched; stamens 5; style column .25 to .35 inch; stigmas 5. Fruits: Schizocarps, fusiform, carpel beak coiled outward when dry; seeds brown to black, ellipsoid to ovoid, ca. .06 inch, appressed-pubescent. Habitat: Lawns, cemeteries, fields, pastures, and disturbed places. Comments: A weedy species that is becoming increasingly common in Kansas. 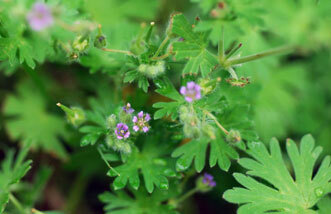 Geranium - from the Greek geranos "crane", alluding to the long fruit and pusillum - "very small".